This is roll-your-eyes-back-in-your-head delicious peach cobbler, recipe courtesy of wonderful Cathy (aka NaturalBlonde). Many of you kind folks took my recent peach cobbler disaster to heart and sent me your own personal recipes. 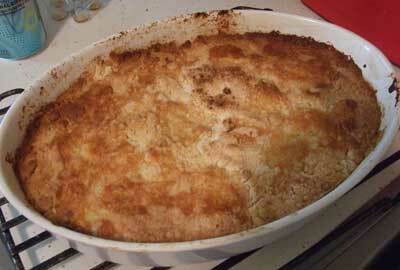 Or sort of taunted me with the news that you had the perfect cobbler recipe, if only I had known. As a responsible member of the internet community, I consider it my duty to respond to you all by making each and every peach cobbler recipe sent to me and also by tasting said recipe. I will probably need to consume the majority of the resultant dish in order to give an objective opinion of each. I still have my friend Dianne's recipe to try out. Anj and Lisa need to send me their recipes already and stop taunting me with their perfect recipes that they have not sent me. I'd be happy to sample any more recipes that readers would like to submit. In the interest of fairness, of course. i made my first sock pattern. i'm scared to death. did this happen with the momogus? i'm pretty sure i'll make other patterns, like a ton of designs are swarming in the head. i just have to knit them. and pattern writing is a pain in the @$$! The pattern DOES travel down the instep, and as far as pics go, I have a digital camera that likes to walk around the house whenever I need it sometimes. It seems to do what it pleases. As soon as it stops roaming AND it has fresh batteries, there will be a pic. cg - hey, why doncha send me a recipe?? j/jjp - you go, girl! it is a scary process, but worth it. i'd offer you some of the cobbler, but is so GONE.